The R3350 is a crappy engine. It throws lots of oil, spews exhaust all over, and isn’t that reliable. 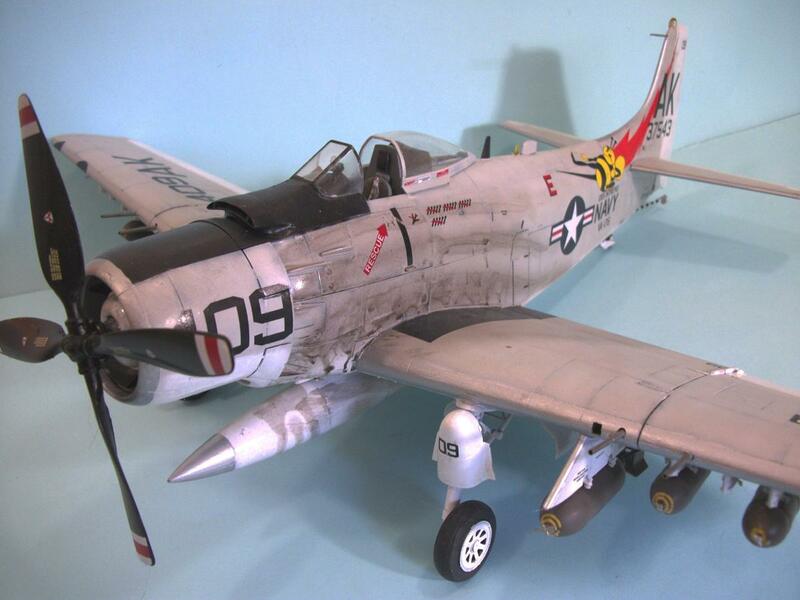 The only reason the Skyraider didn’t use a nice reliable worthwhile R2800 was the extra 600 horses of the R3350. 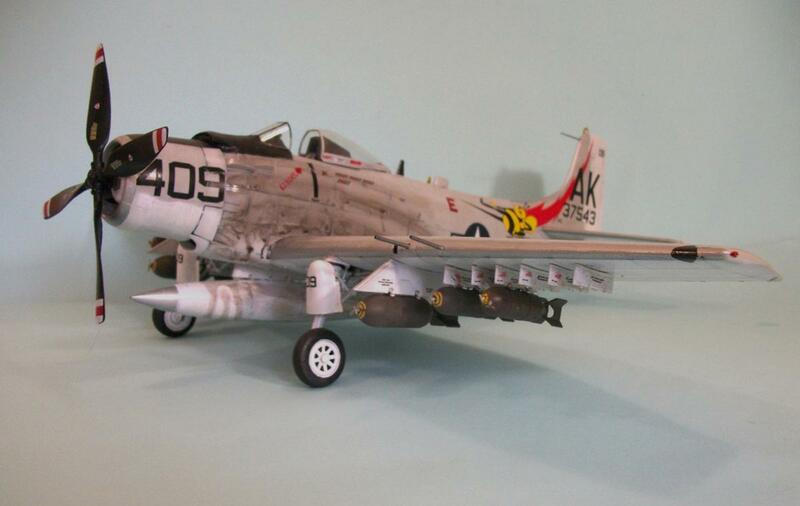 Presented here is a Tamiya 1/48 Skyraider and the 1/32 Z-M kit. 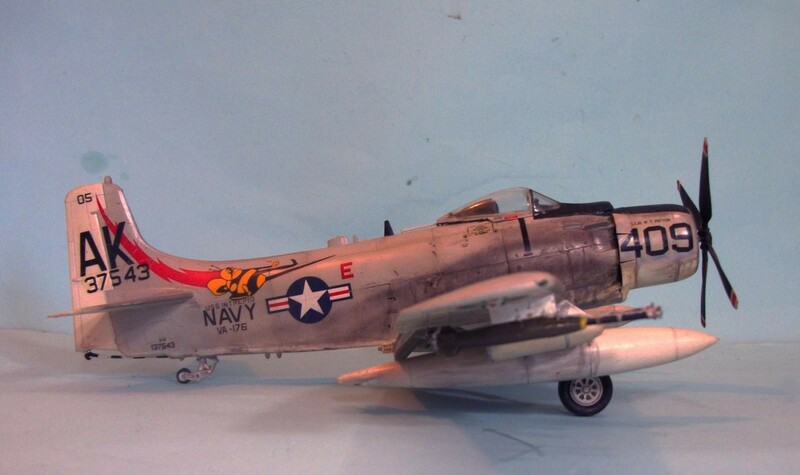 I got the exhaust “tolerable” (according to my friend) by airbrushing heavy exhaust, then airbrushing lots of Tamiya Smoke, then brush-painting thinned Tamiya Smoke so it would “drip” on the fuselage. 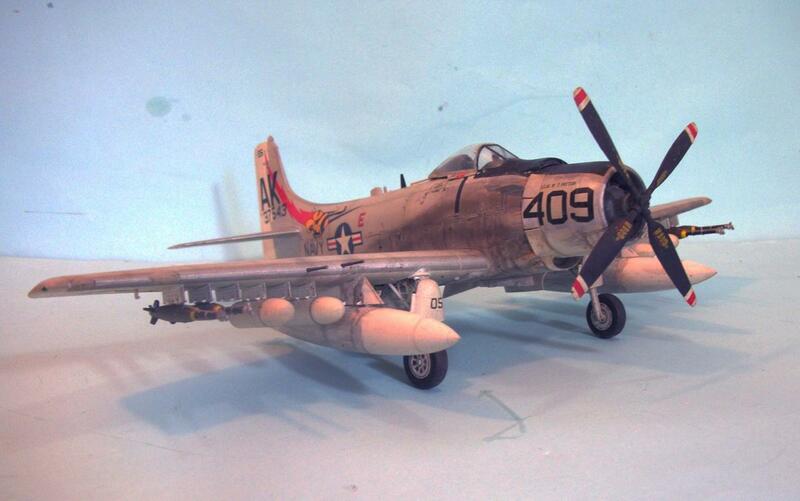 Presented for help for those doing Skyraiders. 24 additional images. Click to enlarge. It doesn’t look if it would pass present day emission tests! 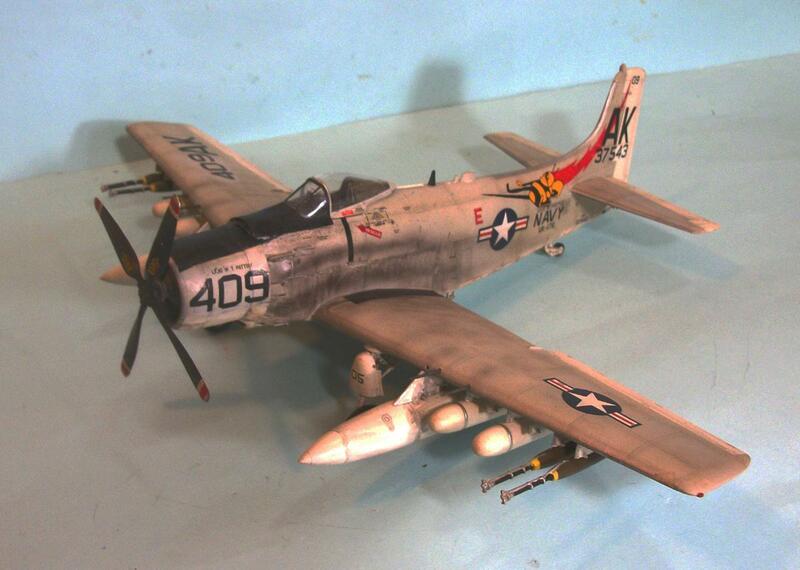 I like a Skyraider dirty as can be. 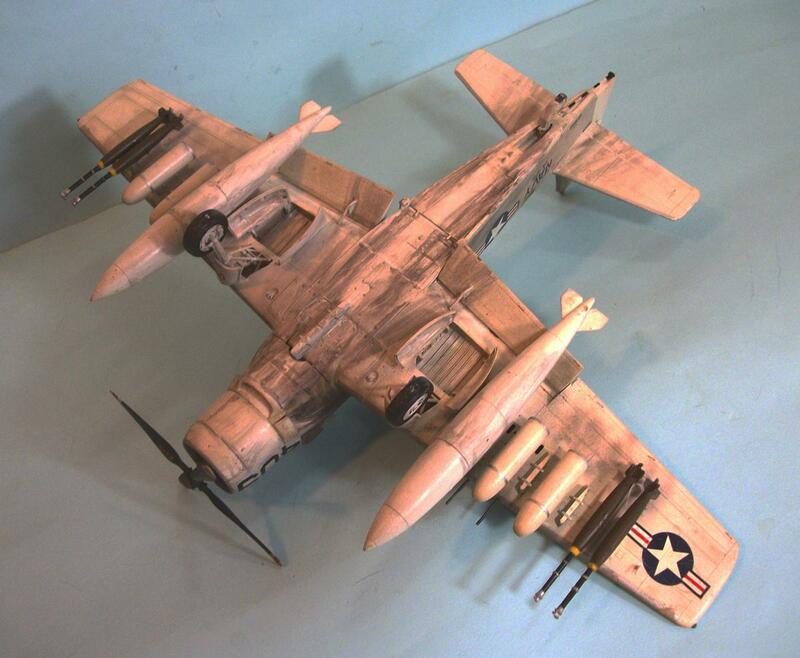 However, that is my personal taste for the A 1’s that I build. 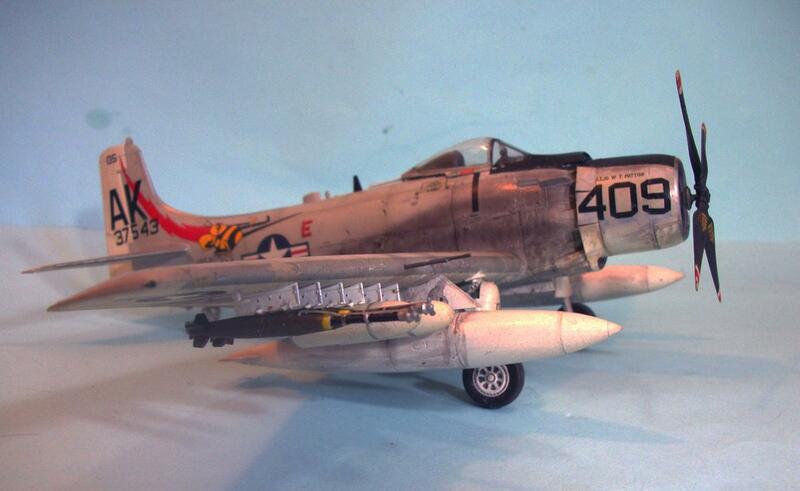 Some photos show Skyraiders that are relatively “clean” with only slight exhaust staining. Needless to say. 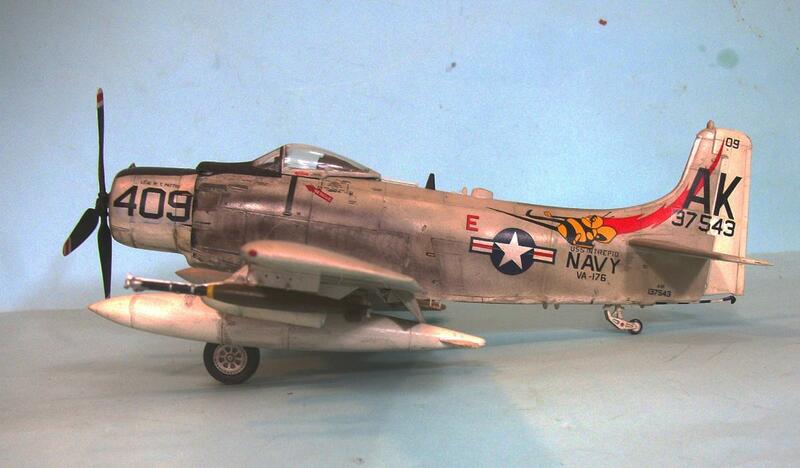 I think that there are enough reference photos available to get the weathering as close to what it looked like in reality and allow for personal taste. Well done Tom, I like this one very much!! 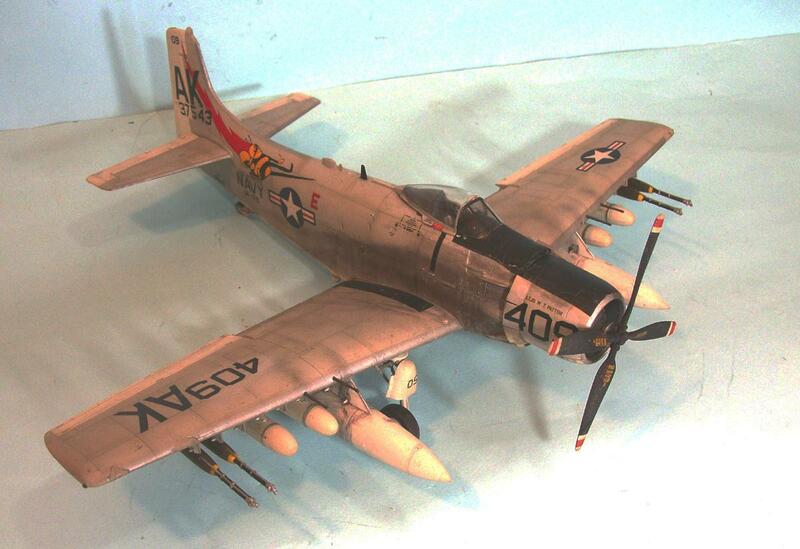 I don’t think I’ve seen a Tamiya Skyraider I didn’t like….including this one. I don’t think of this as a teachable moment. Nor does it win the hearts and mind of the previous poster. When folks are volunteering their work or showing there model coming up with I’m right and your wrong opinions can be poison. Especially, in a organization that is made up of volunteers. Pushing someones nose in a pile and killing them with facts works if your a DI working with conscripts. 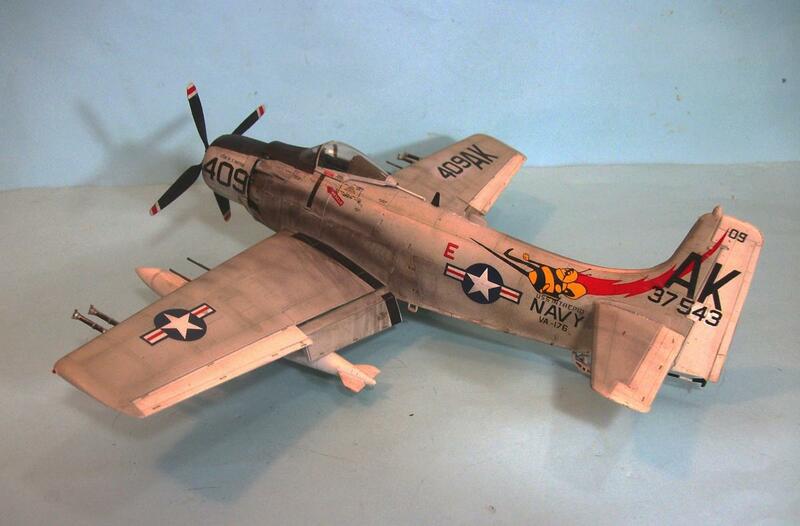 Working with a modeler is a one finger salute. Winning hearts and mind involves knowing that everyone is volunteering their best efforts and are at different skill levels. There are better ways of doing this TC. I have no idea what you’re going on about. 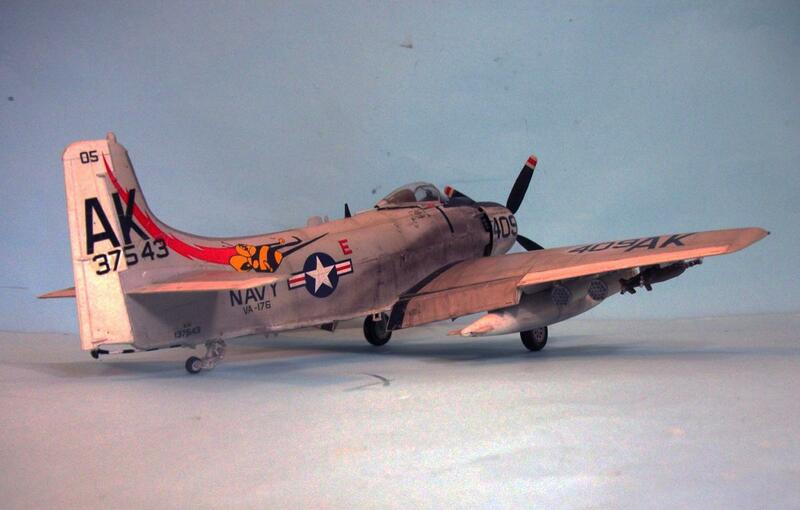 Tom, thanks for posting this tutorial, proof positive that a working airplane doesn’t look like it just came out of rework or the factory. 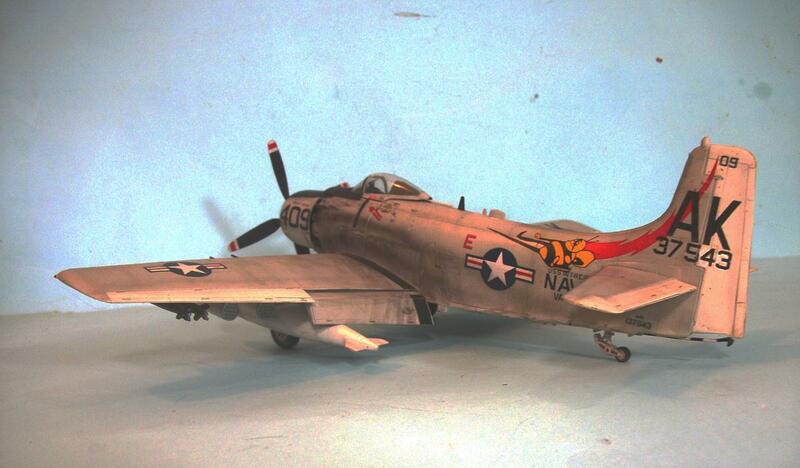 The upper wings take a beating, as well, which I didn’t realize ’til recently. 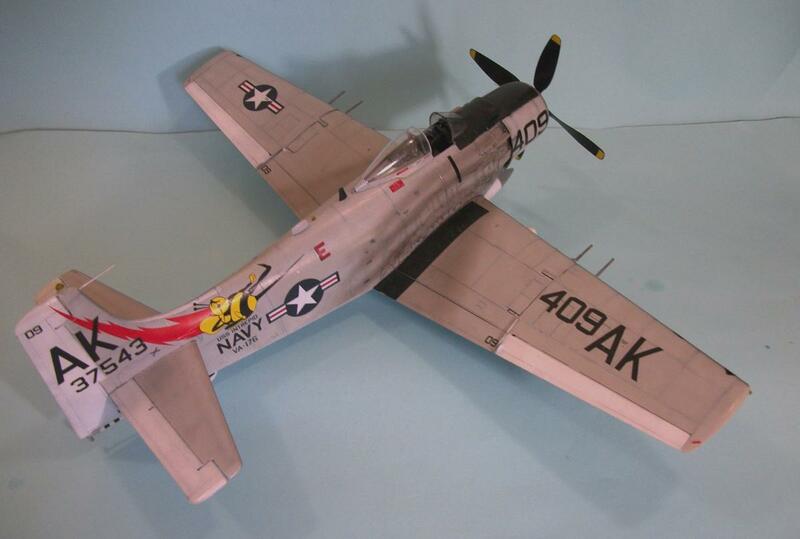 There’s a picture in the Osprey on Navy A-1s that shows that real well. Floating on the boat takes its toll, good old OPtempo. Great stuff! Make a nitpicker barf! Bob, I like “kind of accurate.” Good ‘un! 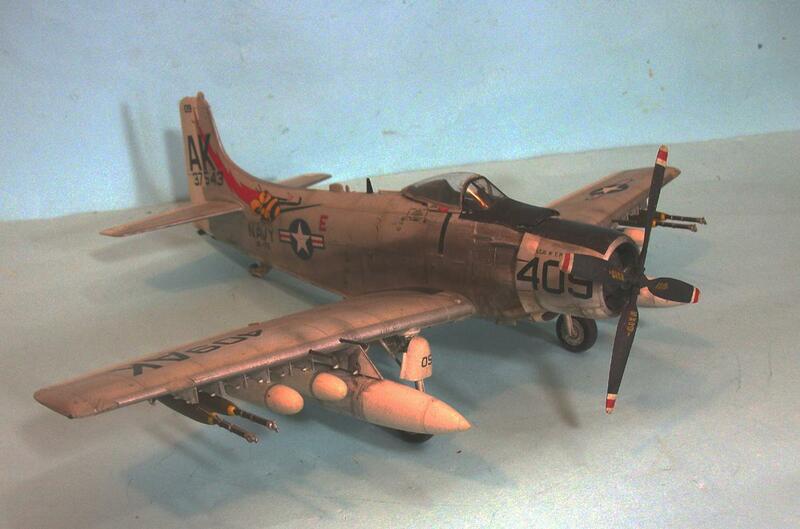 Nice Skyraider’s Tom. And to the conversation, we all have differing objectives in our building, and we bring differing skill levels AND personalities to the table! It is a great hobby leaving a huge array of what’s “best for me!” There really is no “right or wrong” for the builder, as long as he/she is having fun, learning, and celebrating with others. I have no idea why this is being taken as some “I’m right/you’re wrong” idea. 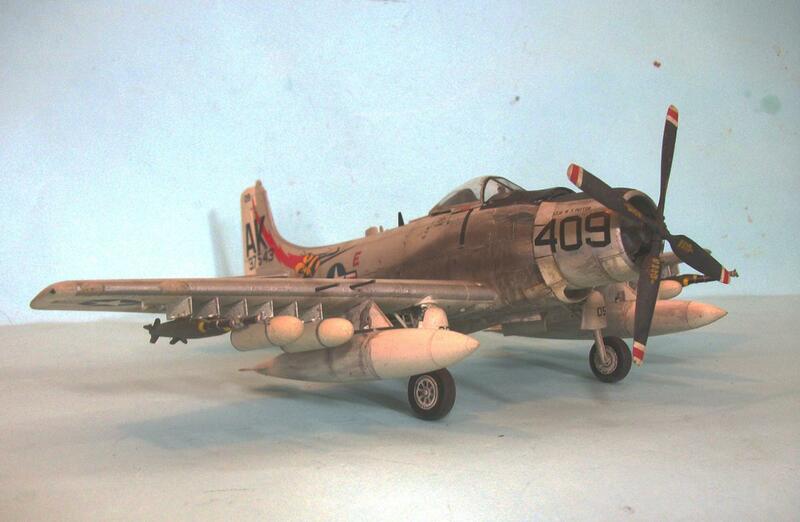 The Skyraider is a trickier airplane to do than a lot of people realize, due to the fact that its normal look is “counter-intuitive” to most modelers. 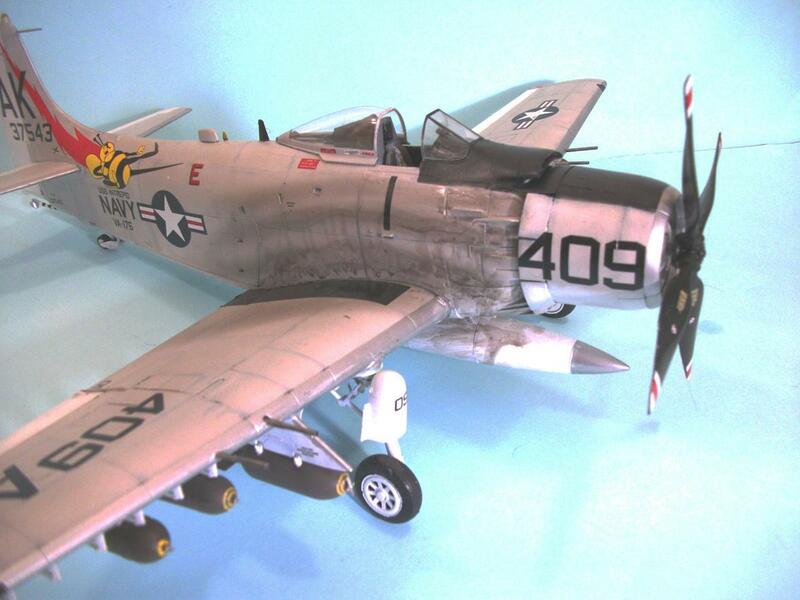 It sure was to me until I talked to two different Skyraider pilots who both told me the “normal” look of the airplane is what anyone with any other airplane would call filthy. Do or do not. Now you have the information to use or not use as you see fit. TC, you know too much. 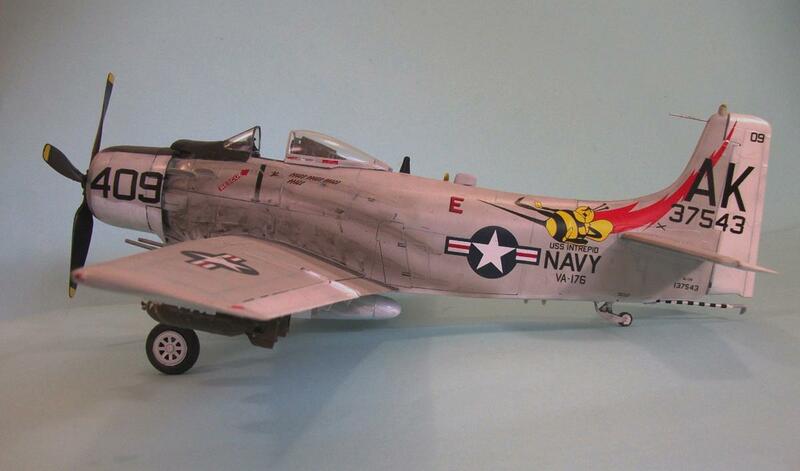 Not everybody has your resume or skill set,has built several thousand models,interviewed SPAD drivers and knows the difference between and 3350 and 2800. I am mindful that many of the folks who post here have different skill sets, ages and life experiences. 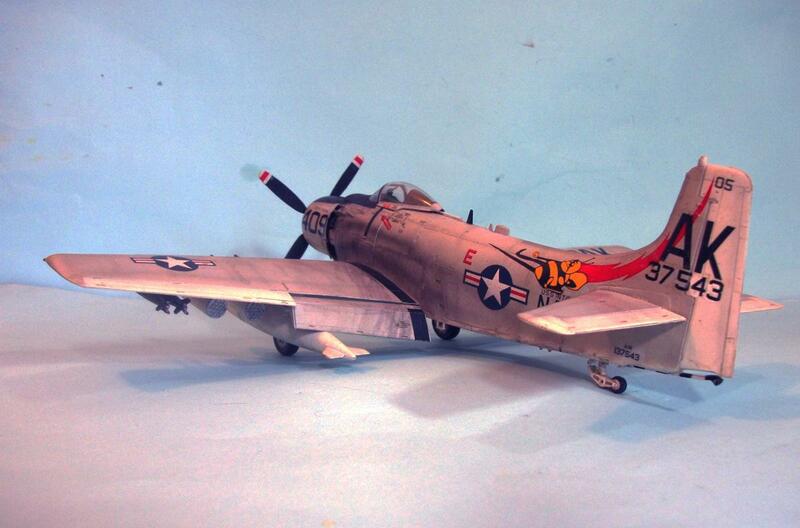 Not everyone is a master modeler but, where all students of life. 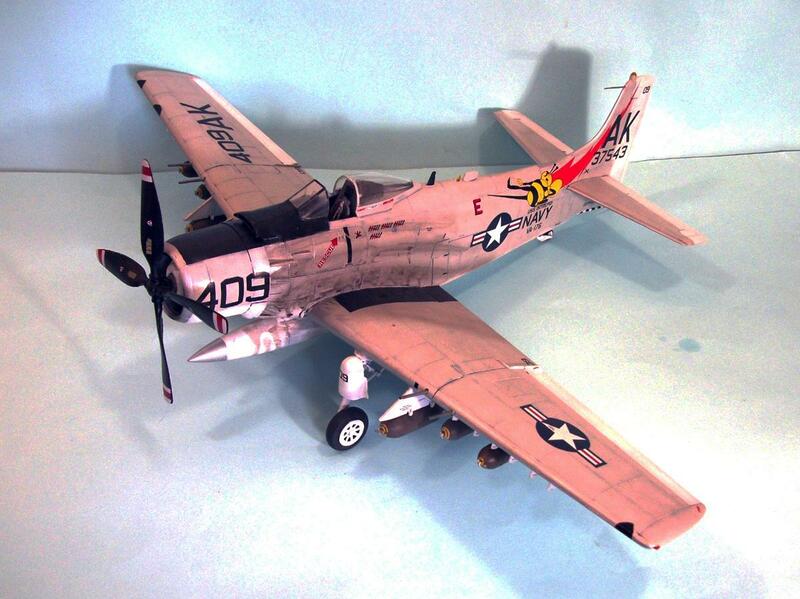 Some folks(The modeler who posted prior to this one) are giving there best, following instructions and doing a good job of making a kit look like the photo on the instructions. For some of us poor sods that is an achievement and a good one at that. Give credit where credit is due first. 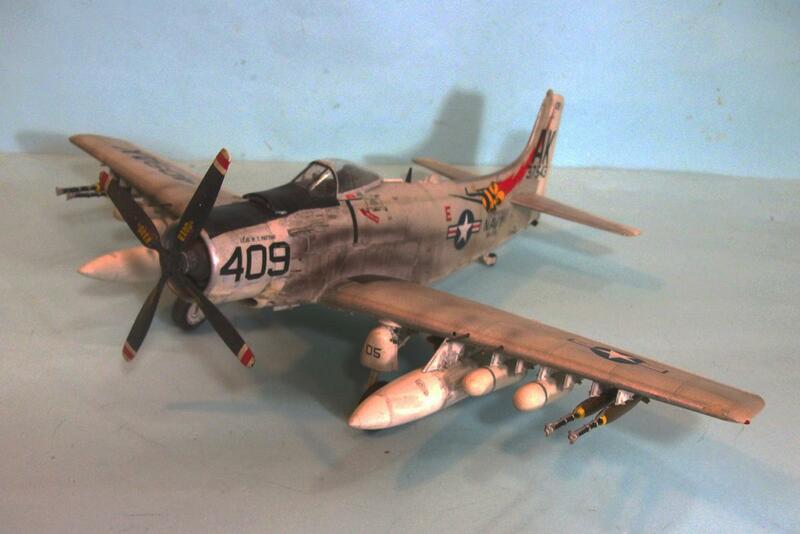 On the other hand if your 1st comment is this is what is wrong with your kit and you follow up with a post on how to properly do a Skyraider. It could be taken as don’t do what the guy did in the prior post. He screwed the Pooch on this one. Technically, your post is accurate as a stand alone post. But, if you want to mentor and win hearts and minds, share your gifts and talents with individual modeler it falls flat. Nice work. They did get dirty. Centerline tanks showed lots of oil from engine leaks too. Gentlemen, a word of editorial comment. I thoroughly appreciate everyone’s balanced opinion. 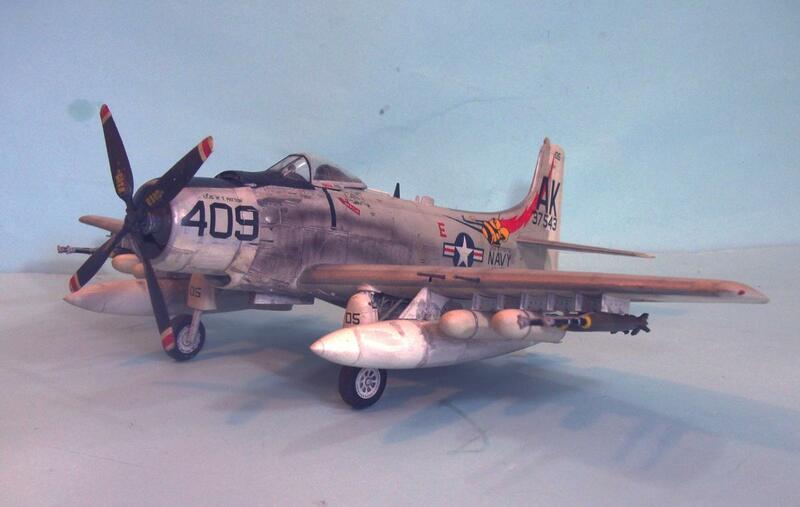 Personally, I have also found a lot to appreciate about this post and the preceding Skyraider article. We all have different skill sets and build for different reasons. For me personally, I want to get a realistic finish. All criticism can be constructive, even the negatives. I personally value both constructive en negative criticism because it helps me to grow as a modeller. 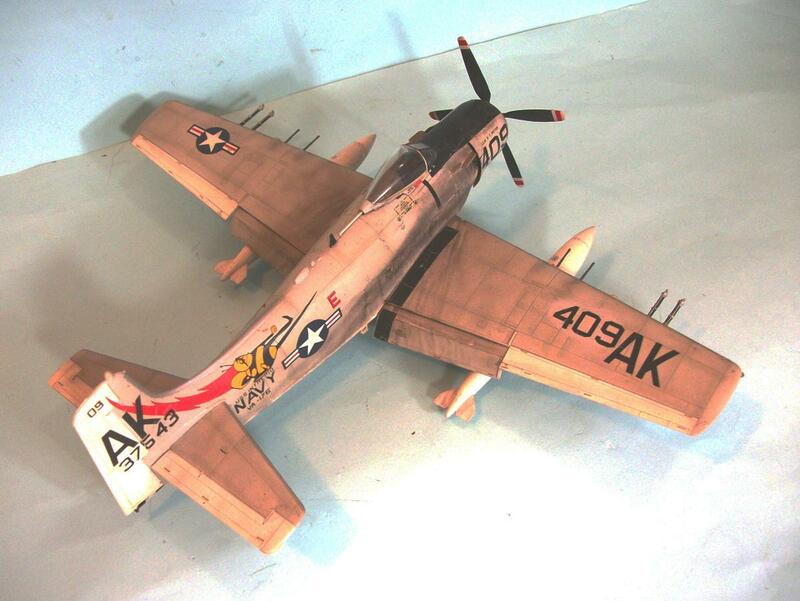 My skill as a modeller has personally grown due to this site. Tom is experienced in many ways and I appreciate his input. 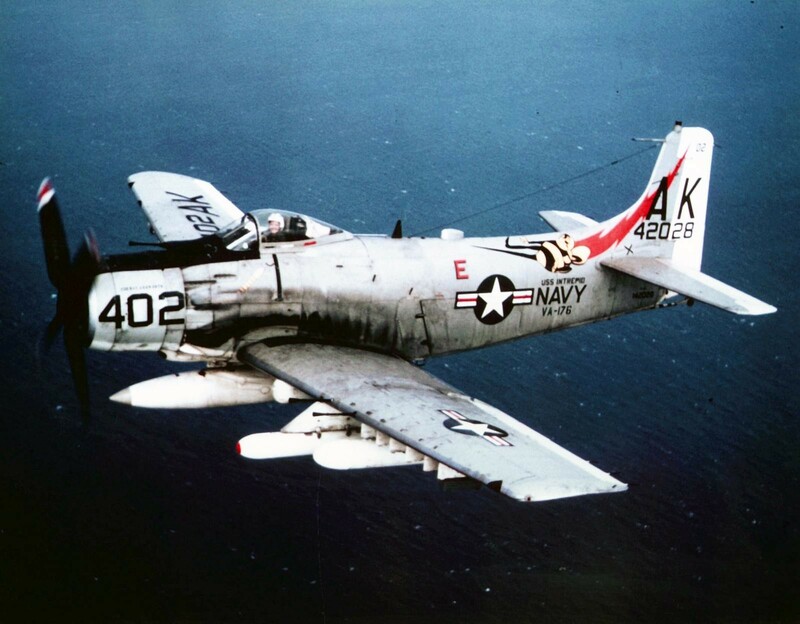 His historical perspective on subject matter is of value to me and I have also been “Cleavered” on some of my posts but I see it in a positive light!! Morne, you summed-up the “debate” perfectly; well-done. Looks great. 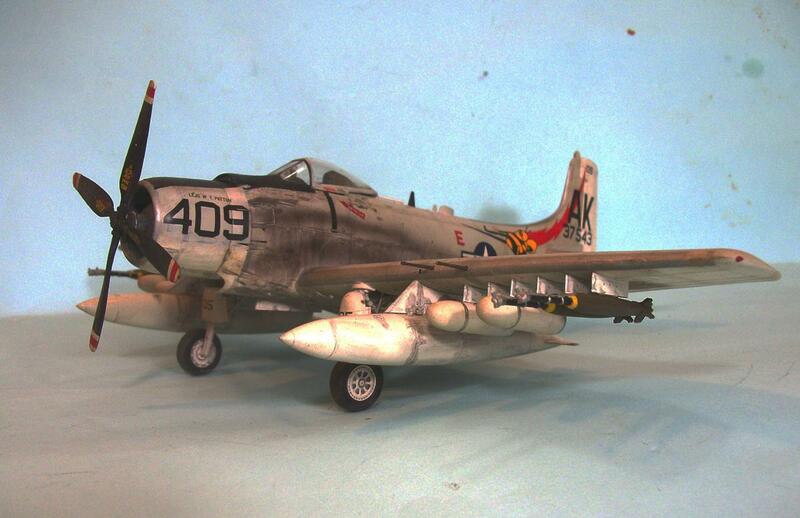 Like mentioned before, put ten Skyraiders next to each other, and not one will be in the same condition. Bu this one looks prefect.